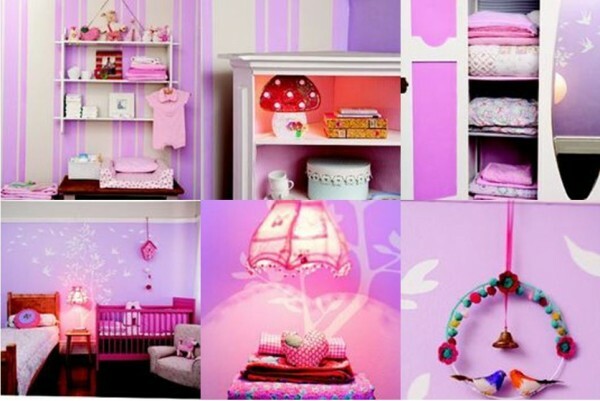 Kitting out a baby’s room needn’t cost the Earth, especially if the room is already established as a bedroom. Old furniture can be freshened up with simple white paint and walls given an unashamedly girlie makeover with pretty pink walls embellished with simple stripes and enchanting wall stickers or stencils. COLOURS: Uncompromising pink upon pink! A blue-based pink such as a lilac will cut through the saccharin sweetness of a pink scheme, as do accents of red and darker pink. The bubblegum shade used on the cot in this bedroom cuts back on the sugar overload. WALL TREATMENT: A lilac pink and marshmallow pink have been painted in a ticking stripe on an off-white base around three walls of the room. This is simple to do with a long ruler and masking tape. Measure the spaces along the top of the wall and the same along the bottom and join them up with the masking tape. Alternatively there are many ticking style wallpapers on the market. On the signature wall a delightful tree and flock of birds wall sticker motif provides a whimsical backdrop. The design also helps to define the space between the cot and the bed. Don’t be afraid to furnish over the motif as this will add another dimension to the scheme – as done here with the cuckoo clock and hanging lamp. FABRIC: Stripes go with anything but adding petite floral prints and delicate paisley designs really bring out the girlie charm. ACCESSORIES: Birds provide a delicate and captivating theme for a nursery but with any theme it’s best not to overdo it. Soft sculptural alphabet cushions with the baby’s initials also add a personal touch. LIGHTING: Hanging a lamp close to the bedside table shows off the delicate shade and provides good, soft light for bedtime reading. A cute beaded toadstool lamp is tucked in the corner shelf. Placing a lamp like this away from the cot will provide enough ambient light if a night light is needed, without shining directly on the cot. FURNITURE: You don’t need to spend a fortune on new furniture for a baby. Vintage shelves and wardrobes can be recycled and repainted to fit in with the scheme of the room. Often baby’s clothes and blankets are far too gorgeous to tuck away so decorate the inside of wardrobes and show off the baby’s finery. Shelves lined with fabric, wallpaper or even wrapping paper will do the trick. Old tables are just as effective for changing areas as a purpose-built changing station and certainly have more charm. There’s the added advantage that the table can be reused as baby gets older. Décor tip: Babies are often given such pretty things ? show them off by decorating the inside of wardrobes or by lining shelf units. Fabric, wallpaper and even wrapping paper can be used for a cheap and extremely effective way to brighten up a dark cupboard. Sam runs her own kids’ décor company specialising in product design of play spaces and play ideas for children. She’s also a décor consultant, focusing on kids’ rooms and presents workshops, giving parents inspiring décor ideas for their offspring’s bedrooms and personal spaces. As a parent, Sam’s motivation for writing and producing children’s décor books and imaginative products is to inspire other moms to be more innovative with their family and home environments. She believes a child’s environment is the first step to creative experience and expression.